So I was thinking of building a fermentation chamber, as I was going back and forth with another member. I wondered would this work for a kegerator as well? He didn't know either we thought it would be a good idea but wondered if it would actually work would it be able to stay cool enough for a corny keg or two. So before I tear apart my mini fridge has anyone done this or have any experience with this type of build. Any info advice and words of wisdom is greatly appreciated. I would think trying to keep fridge temps to use that as a kegerator would overwork the small cooling capacity of the dorm fridge itself. Especially if you plan to keep it out in a garage or other area where it would also have to overcome extra heat. My other thought would be how to pull off having this act also as a kegerator while you are fermenting something at ale temps. What is your budget for a build? Ever thought of just picking up a small chest freezer? I got a brand new small one just for fermentation for $100. If you were to shop around you can pick something up used even cheaper. That would work so much better and be a lot easier. If you already have the mini fridge and can fit a corney keg I would just convert that into a kegerator. Another option is if your mini fridge fits a corney keg, just use a corney as a fermenter. I did that for a while before my current setup. I wouldn't be using this as a ferm chamber. Just wanted to use the same idea of taking the door off to make it longer to incorporate a couple cornys. my mini fridge also has a freezer section at the bottom so no keg would fit, well with the exception of a 1.75 cannonball mini keg. I dont have experience with it but fementation chamber...yeah it has been done. Kegerator...mmm I dont see it working well. Thats the thing with the mini fridges is they are so small and dont have extreme cooling pwer. I think the little compressor on the fridge would be running just about 24/7 and would die within a few months. 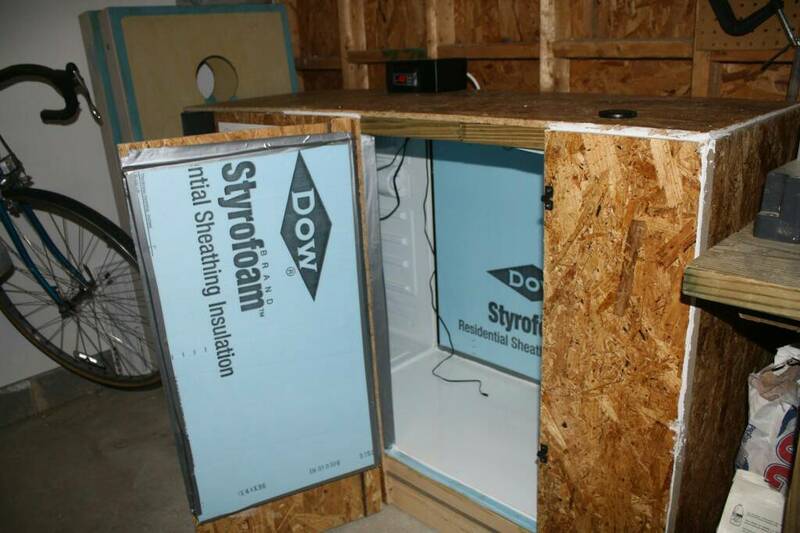 Also, the plywood and styrofoam insulation might not cost that much less than a chest freezer, especially factoring in the time. Lets think of what you would be trying to accomplish with this. You would be taking a compact fridge with minimal cooling power designed for a very compact well insulated space and then doubling or trippling that space you want to cool while insulating it the best you can and keeping much larger items (kegs of beer) that will probably be going into it warm and cool them down to serving temps...asking all this from a system built to keep a couple cans of pop, a gallon of milk and a pack a hot dogs cold with a package of bacon in the freezer. Im not trying to sound like a smartass but thats how I would break it down if a friend asked me the same question. I think thats asking a lot to turn it into a kegerator for a couple corney kegs. Edit...I agree with above in tbat the materials involved you could maybe look at something better suited. Again, what is your budget for the build? Gonna just stick with looking for a good priced chest freezer off Craigslist. I think you would be happier with that and it would be a better long term solution. You can find some good deals on CL and many other places too. 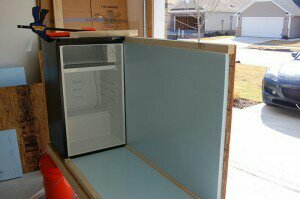 A small chest freezer makes a great fermentation chamber and can be a really nice keezer build.